When her father uproots her family from their solidly Chicago life to settle in a small town on the Oregon coast, Thayer is certain her life is over. But tiny, perfect Abandon, Oregon holds a few secrets that may change her mind. 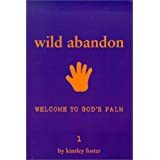 This is the first book of a series titled Wild Abandon by the author and inspired by her own experiences as a teen. For the most part, the novel is about finding yourself, no matter where you are, and teens of all ages and backgrounds should be able to identify. The greatest emphasis is on staying true to yourself and the author does this very subtley but effectively.